Need to storage your stuff? Howard University is located in the Northwest portion of Washington, D.C. and was founded in 1867. It has many alumni who have gone on to serve the United States Government along with governments of many other countries around the world. Whether you need to store your belongings temporarily during summer break or for the long-term, Zippy Shell is here to help. After we receive your call, our friendly team will deliver a Zippy Shell unit right to your front door, where you can easily fill it up, and weâ€™ll take it away when youâ€™re ready. It's that simple. Need to move somewhere else? Donâ€™t worry, Zippy Shell can move you anywhere, nationwide. All of our storage containers are kept in a climate-controlled facility at no extra cost to you. Stop by our How-It-Works page to learn more. 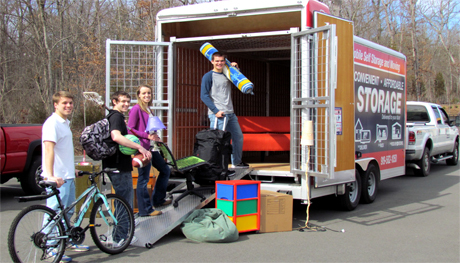 Zippy Shell of Howard University is the best choice for student storage because itâ€™s the most convenient and inexpensive option available in the area. Unlike our competitors, all of our storage containers are kept in a climate-controlled facility for no extra cost to you. Have any questions, then give our friendly staff a call, and let us find the storage and moving solution that best works for you.